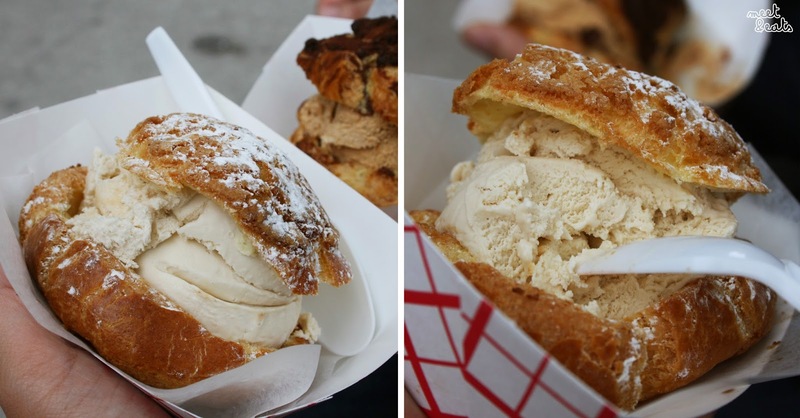 The almighty caterer and bakery, Bakerbots Baking has opened up another store, specifically for their infamous Ice Cream Sandwiches, sharing the same street, Ossington Avenue. Hooray for Bang Bang Ice Cream. Do check out my review on their flagship bakery, here! I was ecstatic to hear that Bang Bang Ice Cream was a gracious 2-minute walk from my door step. Four simple and oddly shaped and sized benches and seats lay scattered in-front of the two wide open doors. You’ll even spot the lovely Archie Andrews, welcoming you into the shop. Across the walls, behind the counter, you’ll see paint tin sized tins lined along a simple free-hanging wooden shelf, each are labelled to show the flavours that this lovely place offers. Non-dairy items are also available to welcome all – of the dairy sort, there is Nocciola, London Fog, Bellwood Stout, Fresh Mint, PB Jelly and Orange Cardamon, just to give you a gist of what’s in store. A chiller stands, open to access and view, filled with tubs of Ice Cream that they have available for immediate purchase. Plain ol’ black and white printed A4 sheets also line parts of the wall to show pricing and other beverages and ice cream sandwiches that you wouldn’t suspect to be found in here – options to an Ice Cream Sandwich of an Hong Kong Egg Waffle, French Macaron, Lemon Meringue, Profiterole and good ol’ Half or Full-sized cookies to wrap around your chosen Ice Cream. These Cookie options are also viewable from the class counter, and are well-descripted with Ice Cream pairings. The few of the cookies available, include: The Everything, RoCocoa Dark Sable, Birthday, Oatmeal, Captain Peanut and Gingerrrrrr – just from the names alone, you can figure out what you could expect. Some pretty good Strawberry Ice Cream! It was very creamy, and had the right treats with every scoop! You’ll get seeds stuck in your teeth every few scoops, as well as little gulps of strawberry pieces, it’s all very worth it! 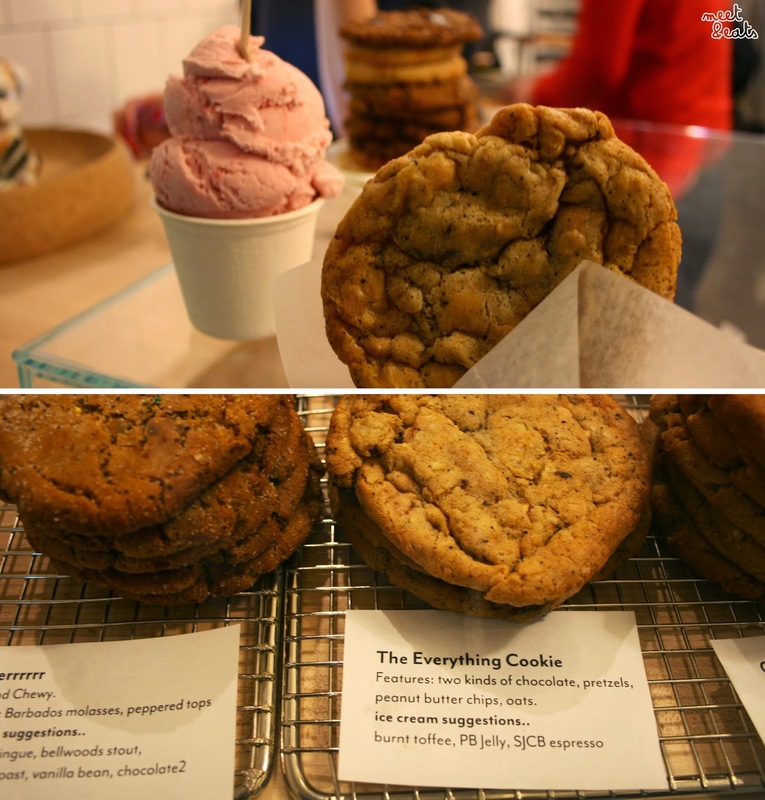 The Everything Cookie, is better off… as an Ice Cream Sandwich! I just can’t handle such a tough cookie to nibble on it’s own. This baby is the deluxe version of the other Profiterole that they serve up here, costing a 50c extra – a very, very worth it 50c as well. 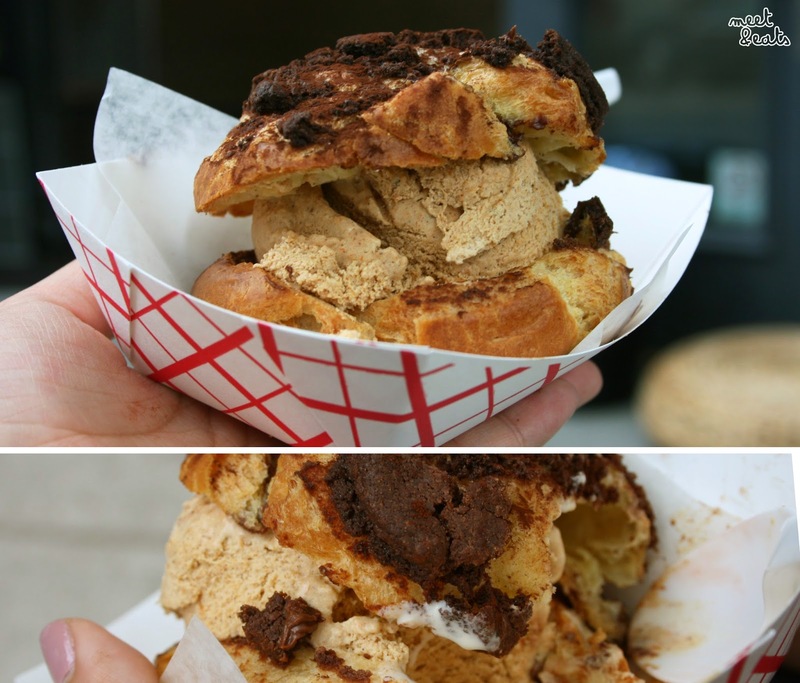 Crusted in Nutella, and filled with a soft, custardy Nutella dollop, it was exactly pillowy, and a perfect match to the well-spiced and balanced Spiced Pumpkin Ice Cream. Oh man was this scoop generous! I love how the Bellwoods Stout scoop sits perfectly in the middle, like it was made for each other! The Profiterole was slightly flakey with a fine Icing Sugar to compliment it, it was so, so good! The Bellwoods Brewery-inspired Ice Cream was very creamy with a slight expected bitterness to it. In love! 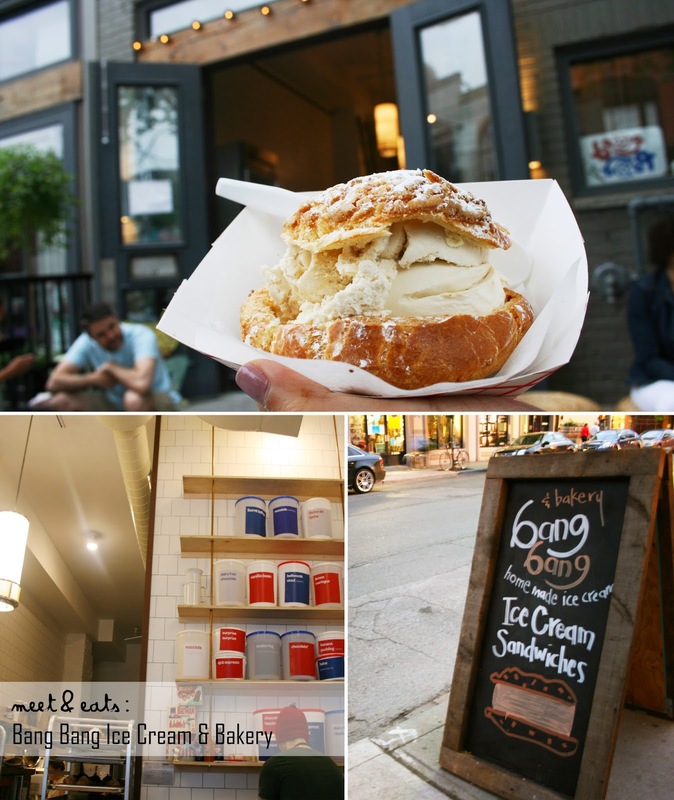 Bang Bang Ice Cream is in no doubt a fantastic spot to head to after a dinner on Ossington, especially with their attractive closing times of 11~12am, It’s also a fantastic spot during the warmer weather to sit out and catch up with a mate. Definitely will be back to indulge in their “Puffle” – a Hong Kong Egg Waffle acting as a cone for a scoop of ice cream!